Small scale furniture is currently in trend as these furnitures are tailored to match the design of small living spaces to provide spacious illusions. However, these furniture doesn’t mean your house will be looking like a "doll-house", you can get a collapsible table or compact sofa to save space in your living room. There is other furniture such as 2-in-1 sofa-bed and book shelf that is able to provide reading experience in your lounging time. Furniture should be avoided to be placed away from the walls, placing them at the center of the room provides a better traffic flow plus your living room will look more compact and spacious. Did you know your colour choices can make a huge difference to your living room space? Neutral colours are the best choices in your living room design. White, beige light colours are the perfect colours to make your living room space look brighter. If you are worried these colours may look dull, you can try texture painting on the walls to create different emotions in your living room. Eggshells and sand texture create a matte texture that makes your walls look bright but yet warm, not reflecting too much light into the living room. Furniture such as coffee table that are transparent may play an important role in achieving spacious living room as they give an impression of not taking much space and less cluttered. Additionally, a transparent coffee table can also highlight your neutral colour rug and not blocking the rug patterns. You may want to put more effort to decorate your vertical space available in your living room to draw attention out of the floor décor. Suitable décor such as floating bookshelves or a painting that complement with your furniture choices not only complete the dimension in your living room, but also boost your taste in décor choices. However, bear in mind that it is not necessary to clump your walls with paintings or other décor because it will create the impression of crowding your living room wall. Geometric paintings or some simple oil landscape painting are highly recommended. In minimalism, less is always more. You may not want your stuff to be clumped in a space. Try to avoid huge furniture such as bean bag, huge plushies as these will take up too much space. In a small apartment, these are not favourable. In-built storage system such as wall-mounted cabinets will help in creating more storage spaces for your living room, keeping your active space look as spacious as possible without taking up any extra spaces. Wall-mounted shelves may also keep all your stuff away from the floor, as clustered things on the floor create a messy impression. An extra platform may be added if your ceiling is tall enough, to create extra space for storage such as a suitcase, foldable bench or even a mattress just in case you have unexpected guest dropped by. Apart from extending your storage to the vertical spaces, you can extend your storage to the floors as well by building cabinets on top of the floor to store extra things such as children’s toys. You may hear of infinity spaces in the mirror world, you can apply this feature to your living room as well to create an illusion of bigger space. This can be done by mimicking a mirror to a window or adding window frames to a cut mirror. The mirror will become the focal point of the room as in this application, and not served the purpose of a mirror. For the mirror choices, a tall, stand up mirror will draw the attention to the vertical space, creating an optical illusion of spacious impression in the room. 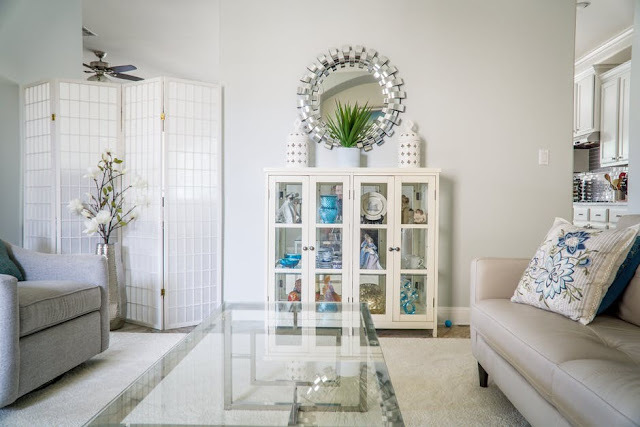 Mirrors also help in brightening your dim hallway or any dark corners in your living room, and not to mention that different shape choices of mirrors can add an artistic yet bright effect to a small space.